Hopefully by now you are already well acquainted with the reports in Community Insight. Within the reports you will have noticed data visualisations and charts comparing your custom area to two other areas. Since our announcement last week, where we added new Community Dynamics data into our tool, we’ve been working hard to show those indicators in our area profile reports. 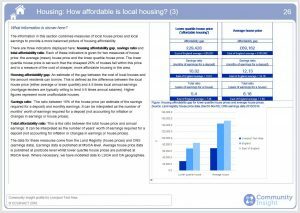 But we didn’t want to leave it there – so, we have also added data on housing affordability to the reports too – enjoy! In addition to the new data, all other data is now up-to-date within the reports. To see the latest data in your reports you must generate new reports for your stock groups. To do this, simply click Request Report on the Manage Stock Groups page. For more information about the Reports in Community Insight, check out the Report section in the Knowledge Base. This month we have added some new datasets on Community Dynamics to Community Insight. The datasets use modeled data from the annual Community Life Survey and can be used to help predict how people are likely to feel about the areas they live in. 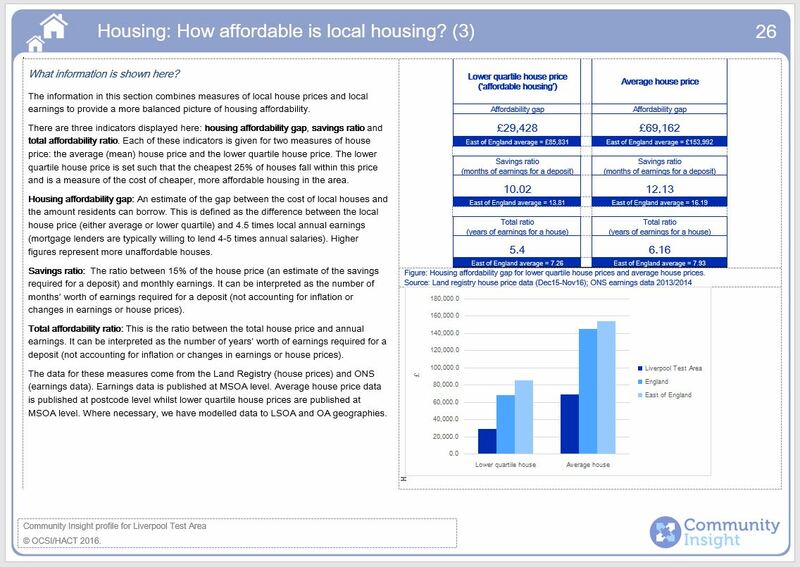 Alongside this new data we have updated a range of indicators covering various themes such as housing, crime, travel time to key services and unemployment. The Community Dynamics data has been constructed by Social Life; an organisation specialising in research and community projects exploring how people are affected by changes in the built environment. 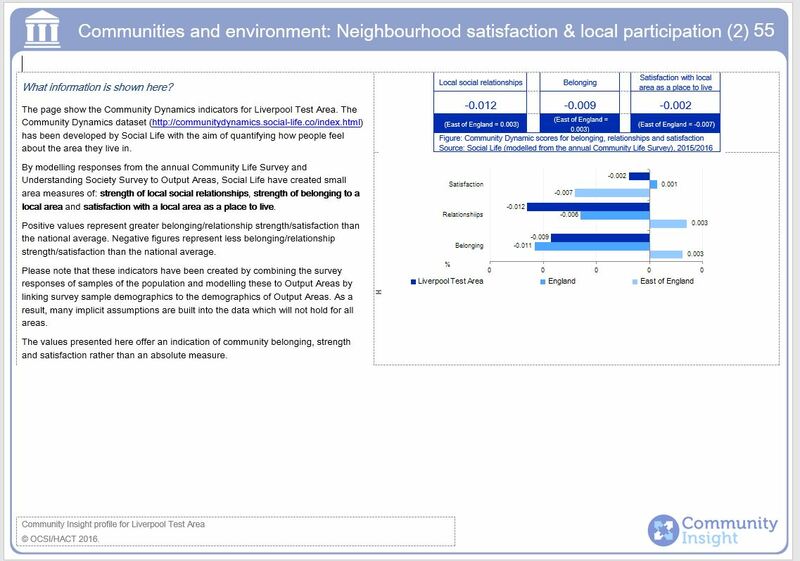 The datasets use modeled data from the annual Community Life Survey and Understanding Society Survey to map this data to Output Areas. Check out our blog for more on how these could be used to help design and deliver local services. Click on the Group Admin tab and go onto the Manage Indicators page. The indicators will be in the Unassigned theme. The indicators will be available on the map as default, within the Community and Environment theme. If you would like to remove these from the map or edit which theme they appear in, you can do this using the Manage Indicators feature. If you need a reminder of how to add new indicators to your maps and dashboards, check out this article in our Knowledge Base. Unfortunately these datasets are not published by the source for Scotland and Wales. If you are aware of similar dataset covering Scotland and/or Wales, please let us know. To see a list of all the datasets available and a full list of the new updates check out this Knowledge Base article. If you have any questions, please do not hesitate to get in touch with us on support@ocsi.co.uk or give us a call on 01273 810270. It has been a busy month for data updates in Community Insight! For those of you interested in data on local business units, we have just updated 31 datasets from the Office of National Statistics. Alongside these, we have also updated the regular monthly and quarterly datasets from the Department of Work and Pensions (DWP). There is also news about some discontinued datasets from the Department of Work and Pensions. Please note, if you are a member of Community Insight Scotland, the business units data is not available on the site. Listed above are the headline indicators from the Department of Work and Pensions. There are also age and gender breakdowns available for the above. To find those indicators simply search the unassigned theme. For guidance on how to select your themes and indicators, check out this section on our Knowledge Base. Next month is an equally busy month for data updates. We are rolling the Land Registry and Police UK updates into the September data updates. So keep an eye on the news blog for more information. The Department for Work and Pensions (DWP) are changing the way that they publish benefit statistics from August 2017. The quarterly working age client group datasets will no longer be produced by DWP and will therefore no longer be updated within Community Insight. For more information see here. When the DWP replace these datasets with new indicators we will load them into Community Insight. To see a list of all of the indicators available in Community Insight and also a full list of the new updates check out this Knowledge Base article.